Since it coincided with my trip to Japan, I decided to pop over to Tsuchiura City Museum a few days after the 'Basara-tachi No Busou -The armor and swords of the warlords who ran through the Warring States' exhibition began to see some of the famous historical weapons and armour they had on display. The museum is running a special tie-in with Capcom between 16th March and 6th May 2013, where they've gathered a wide variety of weapons and armour from the Sengoku period and put them on display; of course, many of the items in the exhibition were associated with warriors who appear in Sengoku Basara. 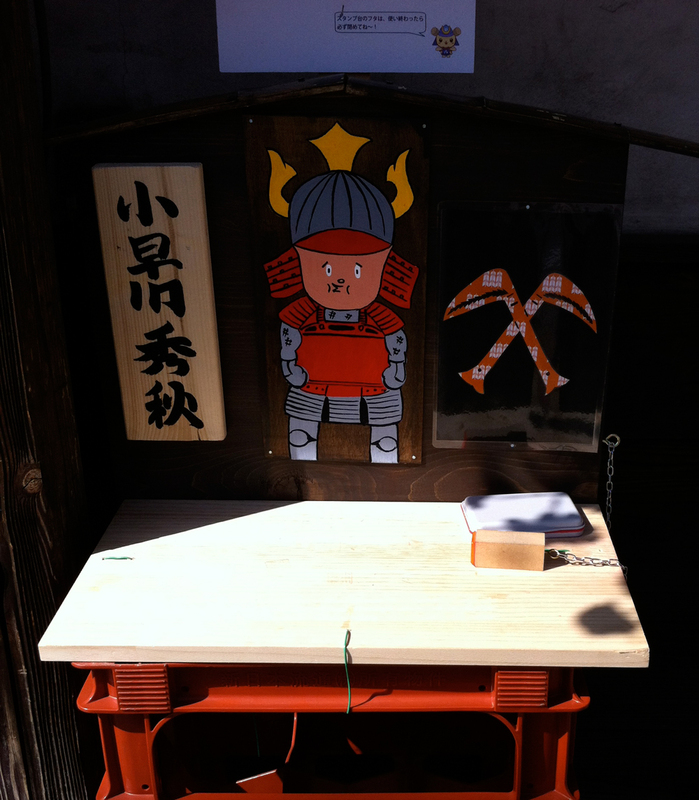 A range of extra activities have been arranged to fully exploit the links between the historical artefacts and the heroes of the game series (and entice more people to visit). Disappointingly, a few of the exhibits weren't yet available for viewing as they were being loaned to Tsuchiura City Museum from elsewhere and wouldn't be on display until April. 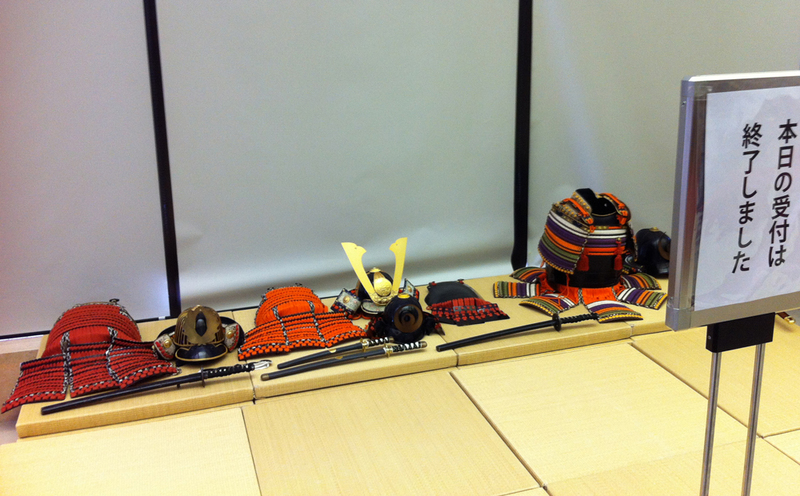 These included Oda Nobunaga's uwagi coat, Ootomo Sourin's armour and, most significantly, Honda Tadakatsu's armour with its impressive horns. If I hadn't had to go back home it would have been worth a second visit a few weeks later to take a look at the items I missed. The advantage of visiting early, however, was that we were able to participate in the stamp rally and collect the limited edition guide book before the museum ran out. According to news reports the exhibition has been enormously popular with more than 10,000 visitors in just over two weeks; stocks of the clear files were exhausted by the 4th April as the exhibition has attracted more visitors than during any other period in the history of the museum. 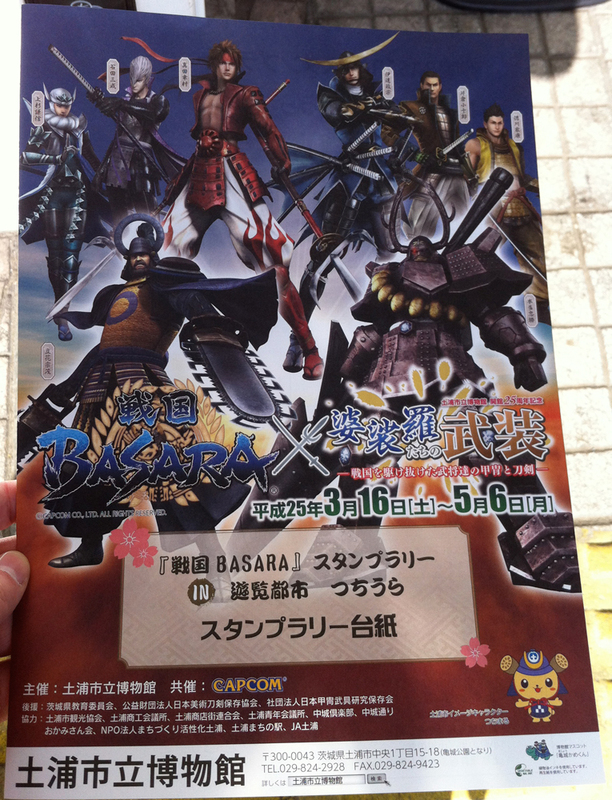 It's good to see the staff expressing their surprise at the way that Sengoku Basara can draw crowds! My visit started with a trip from Tokyo to Tsuchiura, all the way in Ibaraki. The quickest route is to take the Tsukuba Express (TX) train service from Akihabara to Tsukuba then catch a bus to the museum, but I opted to take the JR Joban line to Tsuchiura station instead. The reason for this was that I wanted to take the scenic route to the museum and participate in the stamp rally event. 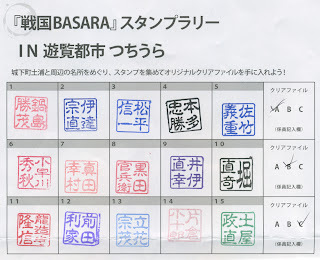 Stamp rallies are a quintessentially Japanese gimmick; you collect a special stamp sheet ('daishi') and then wander around marking it with rubber stamps at fixed locations to prove that you visited them. This particular stamp rally wasn't designed to be difficult since there were dozens of stamp locations dotted all over the city (map), only fifteen of which were needed in order to claim a full set of prizes. After collecting my stamp sheet at the station's tourism booth and purchasing a ticket to the museum (¥600), I noticed very quickly that there was a steady stream of young women arriving at the station and going through the same ritual. Some were alone, others were travelling in pairs. The station also contained the first few stamp locations. One was at the tourism booth, another at the information desk, and a third was near the ticket barriers. 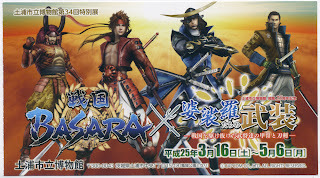 In larger areas, the rubber stamp was often accompanied by a huge Sengoku Basara cardboard standee. To make the hunt more interesting, every rubber stamp showed the name of a famous military commander from the Sengoku era. Some of the local businesses that were participating as stamp locations had also gone to extra lengths to decorate their tables with artwork and background information about the warrior whose name their stamp featured. 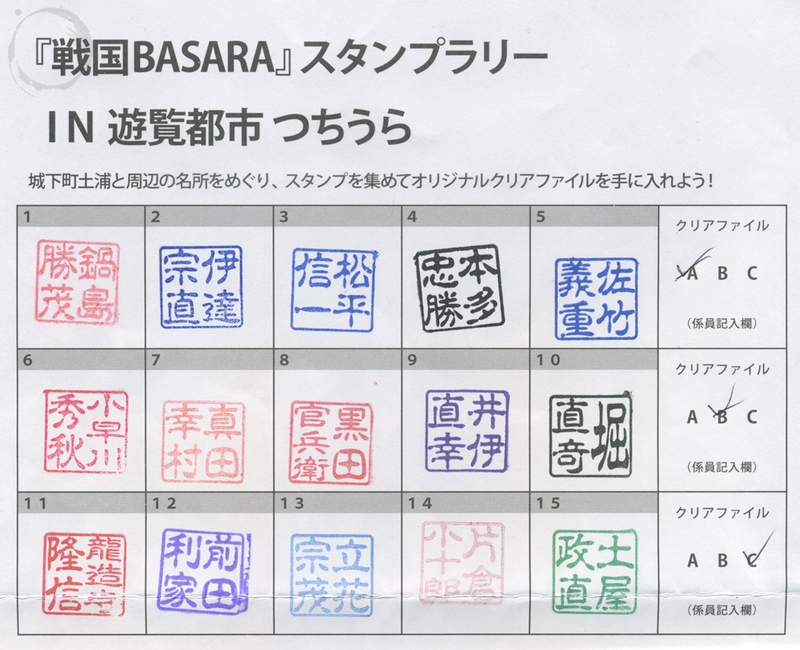 As time was tight, I was originally planning to collect just ten stamps and claim two of the clear files, yet it was so much fun walking around town and visiting the buildings they'd chosen that I ended up completing the entire stamp sheet without noticing. 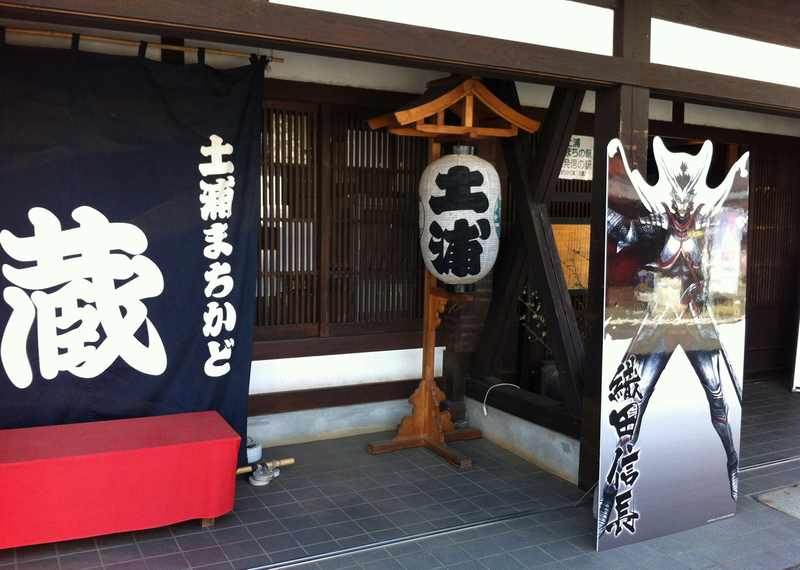 Halfway through the walk to the museum, I reached the Edo-period storehouse Machikado Kura Daitoku, now selling Sengoku Basara merchandise alongside its traditional souvenirs and handicrafts. Coming the Monday after the event had begun, it was obvious that the crowds from the weekend had already bought many of the items that had been on offer, so I left empty-handed. Still, the storehouse was a stunning building, set in a road with several other old structures. Walking through the area was like travelling back in time. The old-fashioned liquor store next door was participating in the event too and the proprietor had come out to the front to greet the stream of young women passing through her shop. When I arrived, she was talking to the girl in front about how she'd been amazed to meet visitors from distant regions like Fukuoka and Hokkaido who'd travelled to the area to take part in the event. There were surprised reactions when a foreigner turned up halfway through their conversation! 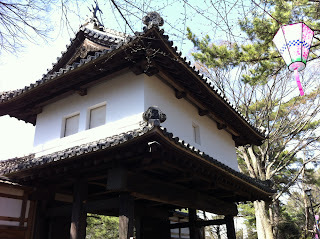 The museum is located in Kijou Park, which was originally Tsuchiura Castle. Today, only a few structures from the original castle remain. I collected Katakura Kojuurou's stamp from one of the restored castle buildings where you could see some of the original building materials that had been kept safe after it was demolished in the Meiji period. Finally, we reached Tsuchiura City Museum, appropriately built where the old castle's ninomaru would once have been. Some of the turtles that Kijou castle/park were named after were swimming in the remaining castle moat nearby. 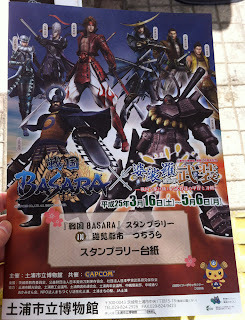 The streets around the museum were lined with flags proudly advertising the Sengoku Basara tie-in. After collecting the final stamp from the museum entrance (bearing the name of Tsuchiya Masanao, promoting the local area's history) I collected my reward from the booth that had been set up outside to administer the stamp rally. The museum had a better gender balance. As well as all of the girls shuffling in from the stamp rally, there were some older male fans, couples and even a few families. I caught my breath in the museum's lobby area and flicked through the guidebook I'd been given. One thing which is worth noting is that it didn't seem as though there were any facilities for English-speaking visitors at all; this isn't surprising, as the area is a little out of the way. Thanks to the design of the exhibition, though, all that's needed to be able to enjoy everything on display is a little advance planning. 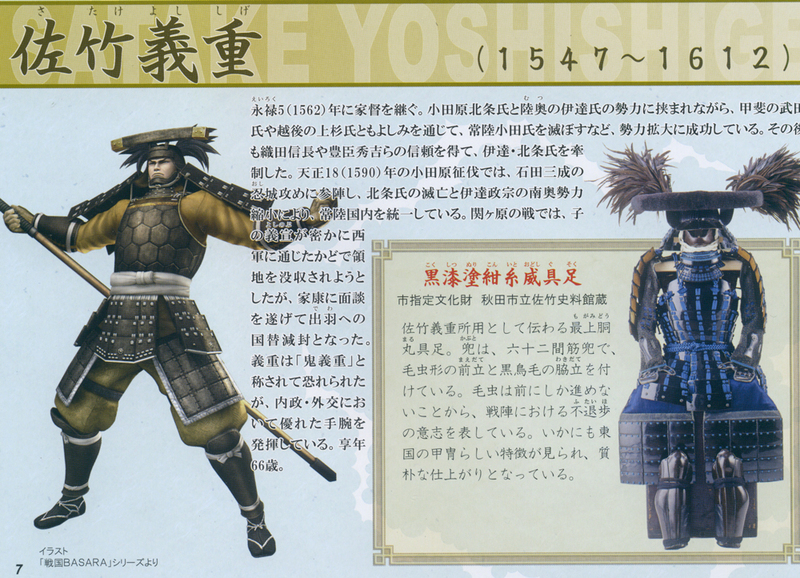 The town's tourism website has an English section and Sengoku Basara fans can use the pictures of the familiar game characters dotted around the museum and in the guidebook to identify most of the items on display, as my travelling companion quickly found. Feudal warlords often had such elaborate armour designs that they can be recognised by anyone who has played the games, even without any labels at all. 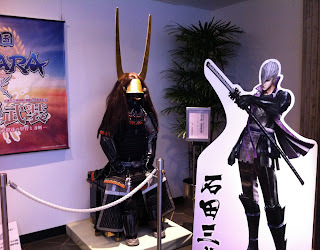 The lobby contained a few treats of its own, like a gigantic screen playing footage from the HD Collection to tempt normal visitors to give the Sengoku Basara games a try and leaflets you could pick up to learn more about the series. Photography wasn't allowed in the main exhibition rooms, so I took some pictures in the lobby instead. 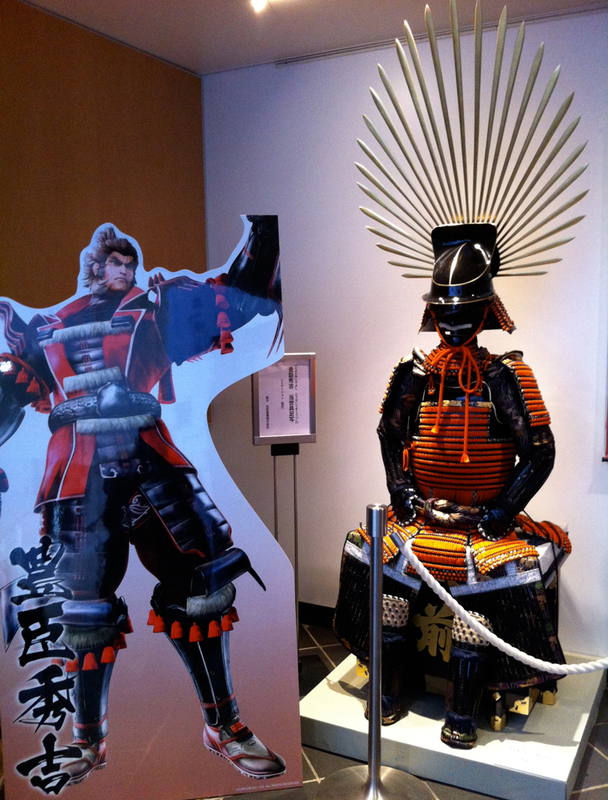 The first thing you see as you enter the museum is a big display with replica versions of the famous armour worn by Toyotomi Hideyoshi and Ishida Mitsunari. The exhibition rooms were arranged more traditionally, it was only the replica armour outside which was displayed next to standees of the warriors. I suppose it might seem a little odd that the two characters who appear first don't actually wear the famous kabuto helmets in their pictures. Behind Mitsunari came the first of the main exhibition halls, showcasing weapons. The displays seemed much more interesting than those at the Sword Museum in central Tokyo because of the detailed descriptions of the history of each blade. The museum also provided simple explanations about the different components of the swords. They had a good mix of older weapons and newer ones so you could see how the designs would change slightly over time. I felt that the Sword Museum was more for weapon fanatics who already had some knowledge about katana. 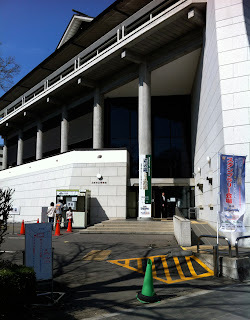 Tsuchiura City Museum gave a gentler, less specialised introduction. Next, I went upstairs to the main exhibition area. 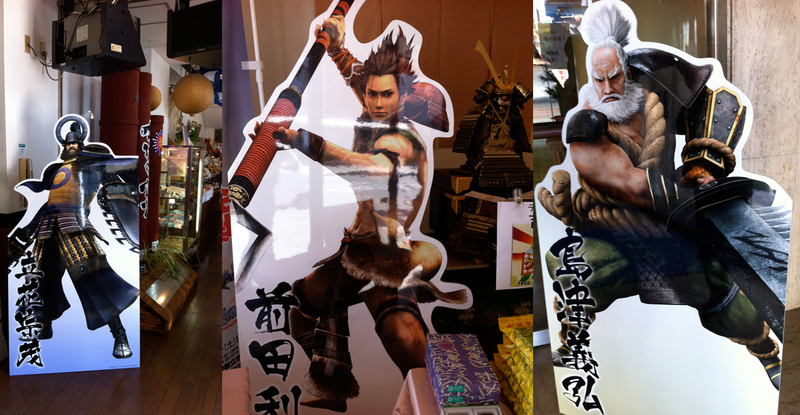 The top of the stairs was completely dedicated to the Sengoku Basara characters. Tsuruhime got to ride in her very own boat at the top of the staircase, assertively pointing at anyone who came to take pictures. Next to her were the replica sets of armour which visitors could dress up in. The area was closed when I arrived, opening later in the day to be swarmed by excited youngsters posing for pictures and waving swords in the air. A game corner had been set up with a pair of PS3s running Sengoku Basara 3 Utage and the HD Collection. A young man was watching the demo video on one screen drowsily while his girlfriend painstakingly picked accessories for her character on the other. 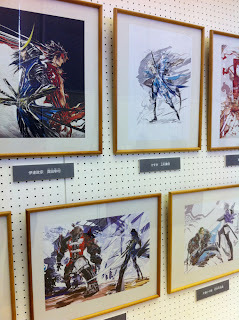 Next came a large art gallery with illustrations drawn by series character designer Tsuchibayashi Makoto. There was a great selection of pictures, with labels so that people unfamiliar with the series could see how their favourite warriors were represented. Finally, just before entering the main exhibition hall, there was a small gallery previewing the artefacts that were on display next to a picture of the character who originally owned them. A variety of warriors from the Sengoku period were featured, not just those who have appeared in the game series so far. 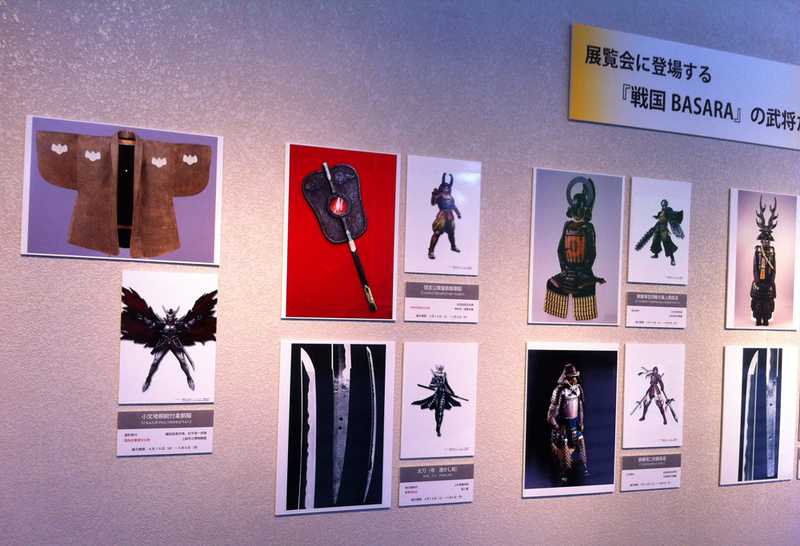 The exhibition hall was dark and not too full of people, so it wasn't hard to slowly file around and spend some time examining every blade, kabuto or piece of clothing on display. It was thrilling to stand in front of the old military equipment and imagine how it might have been used. Some of the items must have witnessed some extraordinary scenes in the last few hundred years as they have been passed down from their original owners. This video (not recorded by me) gives a good idea of what it was like inside the hall. The museum provided detailed information at every step, explaining how a few of the weapons had been used by several different famous figures. There were many more exhibits than the handful of items shown above, all arranged according to the clan to which they were linked. Once we'd had our fill of the displays, we headed back to Tokyo to enjoy the rest of the afternoon. In summary, the Tsuchiura City Museum and tourism bodies had put on a marvellous set of attractions for fans of Sengoku Basara and Japanese history alike. If we'd wanted to explore further it would have been very easy to make a full day trip out of the sights Tsuchiura has to offer. The museum is open between 9:00 and 17:00 (final admission 16:30) every day of the week except Monday. During the holiday period at the end of April these dates will change slightly; it will be open on Monday 22nd April, 29th April and 6th May and close on the 9th April, 23rd April and 30th April instead. If you happen to be visiting Japan before the event is over, I thoroughly recommend popping to Tsuchiura to take a look! This is so cool. To think that so many of the armours/clothing have survived to this day! 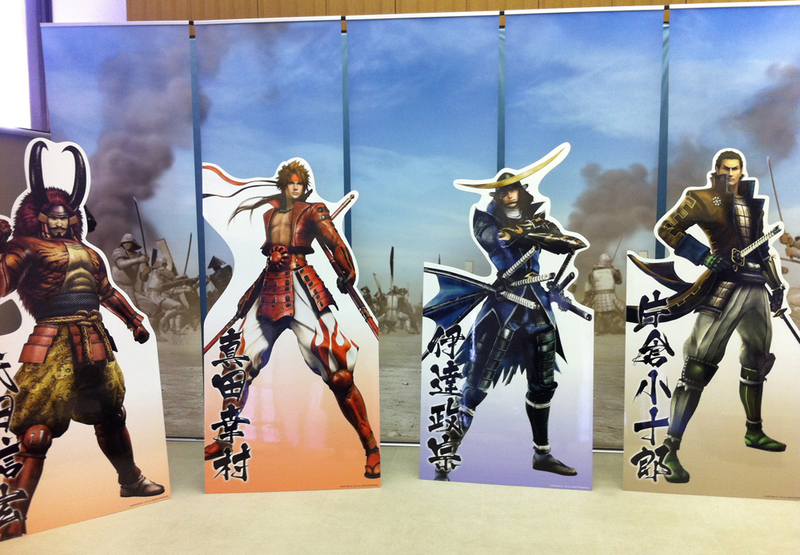 I've seen pics of them before, and seriously, those sengoku warlord armours are just CRAZY stuff. 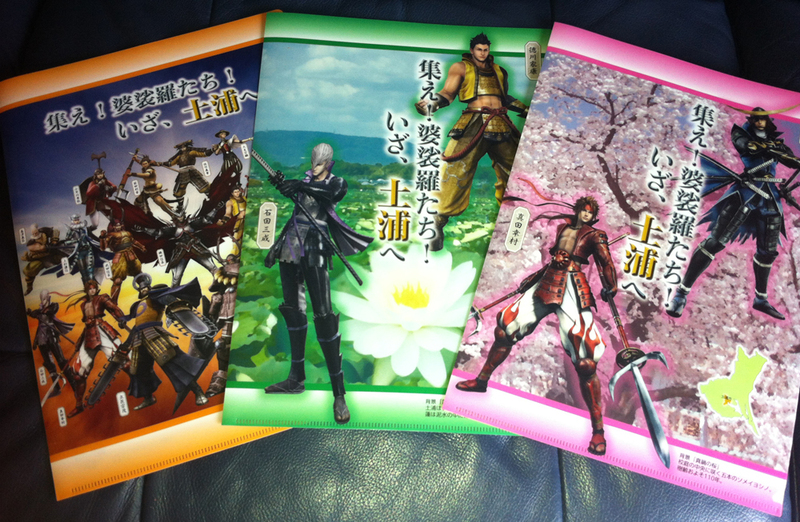 I mean look at Hideyoshi's and Mitsunari's - what on Earth?! Did they actually wear that? If so, it must been during purely ceremonial events to impress people. Hideyoshi probably had to have a guy standing next to him and support the helmet or something. I thought Hanbei's alternative game outfit was so weird with the handlebar helmet, then I saw that it was actually based on the real Hanbei's real helmet! Soooo weird. 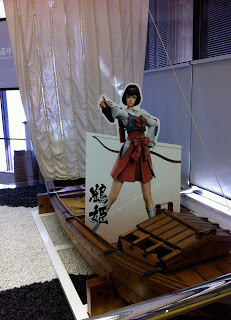 Also lol at the Tsuruhime randomly standing on a boat and pointing at people. 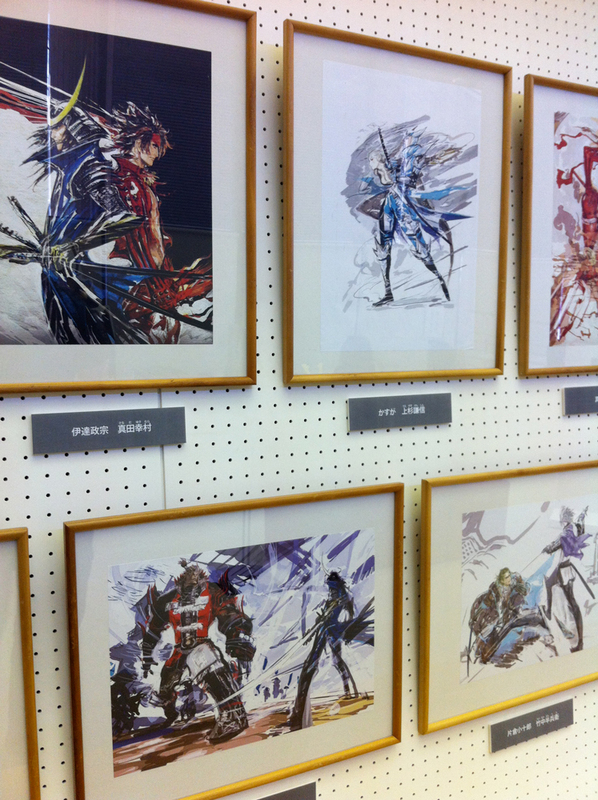 It's also pretty crazy how popular Basara has become in Japan. The makers of Sengoku Mosou must be so jealous! I have to admit I spent most of my time on another trip (to Sendai) worrying about how Date Masamune ever managed to get through doors wearing his helmet without hitting himself on something! Hideyoshi's helmet is out of this world. 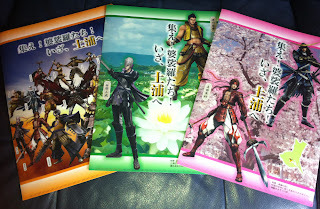 I love it, though Mitsunari's is probably my favourite (I'd like to see an alternate costume with him wearing it in the games, but they probably want to stay away from making him look anything like the Mitsunari in Musou). Muneshige's real armour looks so close to what he wears in the game that my partner was amazed. It was fun imagining how intimidating it must be standing in front of someone dressed that way, even if it was just in the camp between battles.